Let us go forth to meet the transfiguration of Christ, splendidly celebrating the forefeast thereof, O ye faithful; and let us cry aloud: The day of divine gladness hath arrived! 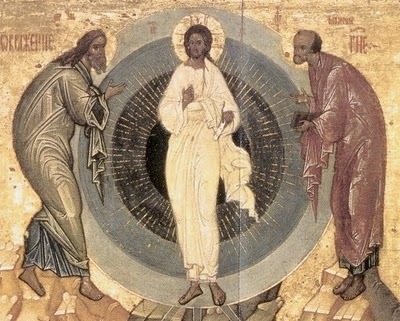 The Master ascendeth Mount Tabor to shine forth the beauty of His divinity! Human nature is made divinely luminous today by the transfiguration of God, and crieth out in gladness: Christ is transfigured, saving us all! ➢ The parish is looking to purchase new vestments for altar servers. Please give designated donation if you would like to contribute. Adult Education Classes will start on Wednesday, following Vespers. Choir practice on Saturday, 4.30 pm. 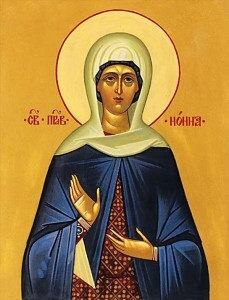 The Dormition Fast is going on; please consult the calendar for daily fasting directions. Feel free to bring fruit to the Divine Liturgy tomorrow (Holy Transfiguration) to be blessed following the service. The Yogurt Hut event will take place Sunday, August 19th, 12-4 pm. Plan to be there, to eat delicious frozen yoghurt, and invite your friends as well! On August 5 the Church remembers Saint Nonna, who is often chiefly identified as the mother of Saint Gregory the Theologian. She was indeed his mother, but there is much more to know about her. Raised in a Christian family, Nonna learned early to love Christ. She was also a dutiful daughter. So when her family arranged an “advantageous” marriage to a wealthy landowner, Gregory of Arianzus, she obediently accepted him as her husband. But the marriage was a source of pain to her, because she loved Gregory and worried about his salvation. He was a member of a pagan sect, and a fire worshipper. Nonna prayed fervently that her husband would come to the true faith. Her son Gregory, in his writings, describes the way in which her prayers were answered. His father, he writes, had a dream in which he was singing the first verse of Psalm 122 (121): “I was glad when they said to me, ‘Let us go to the house of the Lord.’ ” The dream was so vivid that it made the elder Gregory actually want to go to church. This was the beginning of his conversion to Christianity. The elder Gregory attended the Ecumenical Council of Nicaea and was baptized there. He was ordained to the priesthood, and later was made Bishop of Nazianzus. Nonna was made a deaconess. Both of them gave tireless and loving service to the people around them. Their nephew Amphilocius became Bishop of Iconium, joining them in faithful service. In her later years, Nonna experienced the greatest loss a mother can have, not once but twice. In the space of two years, her youngest son died, and then her daughter. Though she bore these deaths as God’s will, her distress affected her once-vigorous health so that she became weak and had little appetite for food. Her son Gregory describes a dream which restored his mother’s health: “It seemed to her that I…had appeared to her suddenly by night with a basket of the whitest bread. Then I blessed these loaves with the Sign of the Cross, as is my custom, and I gave her to eat, and with this her strength increased.” Saint Nonna lived for several more years, spending most of her time praying in church after her husband’s death. In a reading for today, Saint Paul writes (I Corinthians 3: 9) that “we are God’s fellow workers.” Saint Nonna, in her many roles, fulfilled that one as well.